Yesterday was our last full day in Oahu. Ryan and I are catching a plane back to Florida early this evening and hope to spend a few hours at the beach before saying goodbye to Hawaii. 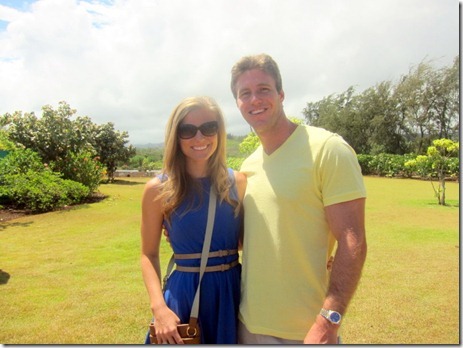 Our final full day in Oahu yesterday was yet another fun and delicious one. 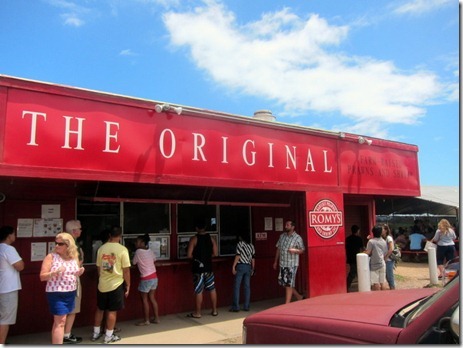 Aside from the pristine ocean views and fun outdoor activities, I must say I’ve been so impressed with the food in Oahu. The food I’ve consumed in Hawaii has been some of the best I’ve had in my life. I am a seafood lover through and through, so naturally all of the shellfish and fresh fish stuck out to me, but I’ve been equally blown away by Oahu’s produce. 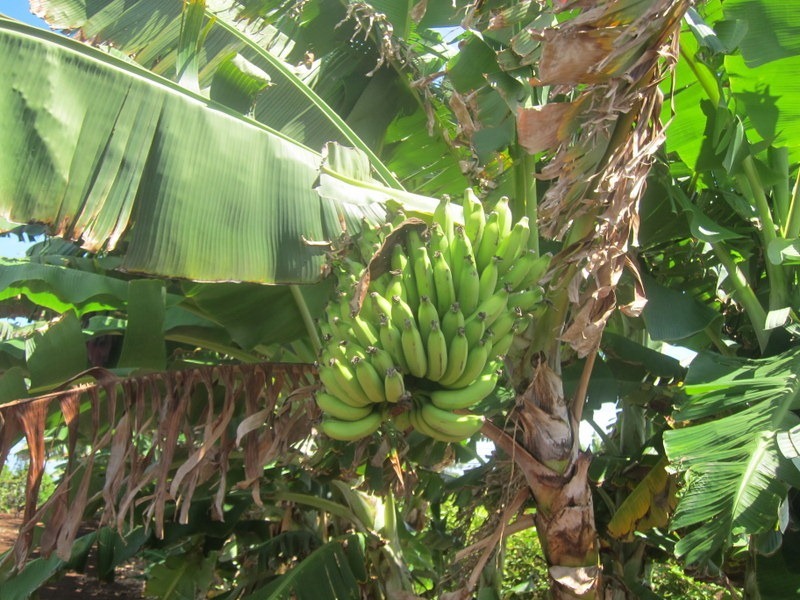 The vegetables and fruit I’ve tried on the island have been so full of flavor. 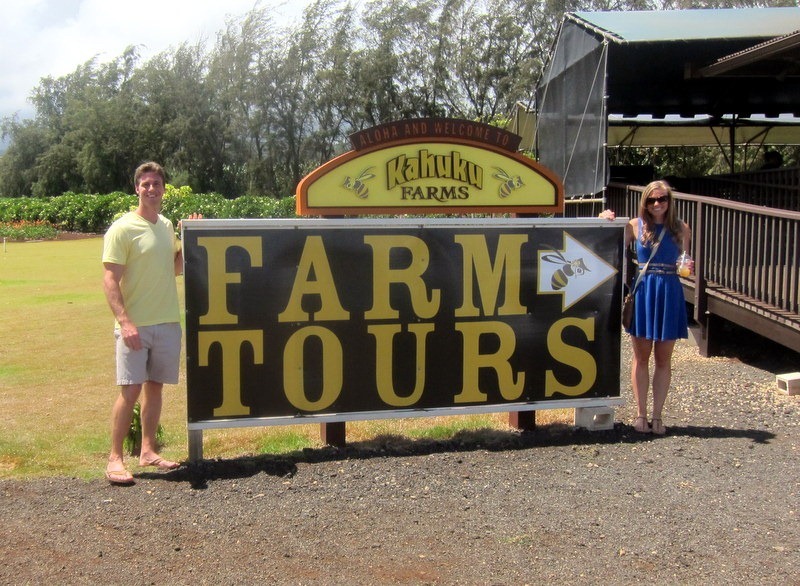 Our first adventure of the day on Sunday took our press group to Kahuku Farms located in the North Shore of Oahu. We were greeted by the husband and wife who own the farm and piled into a little tram for a brief tour of the land. 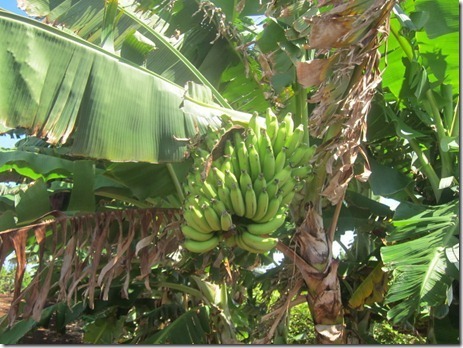 We learned a lot about the farming process and saw tons of mangoes, apple bananas and papayas. 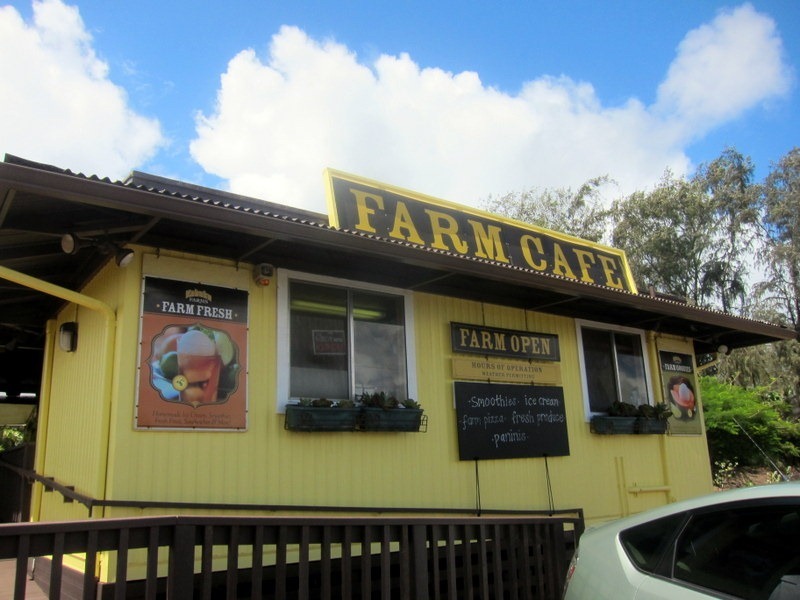 After our short tour, our group walked over to the farm café for a fresh lunch made with their freshly-picked produce. First up was a cup of plantation iced tea (sweetened iced tea with pineapple juice) that was served with a scoop of creamy sorbet. The perfect afternoon treat on a sunny day! 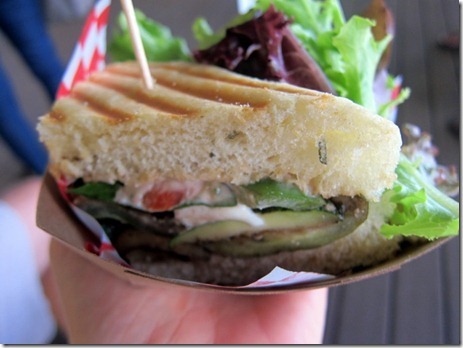 We were also served a panini and salad plate with grilled eggplant, zucchini, peppers, tomatoes and mozzarella. 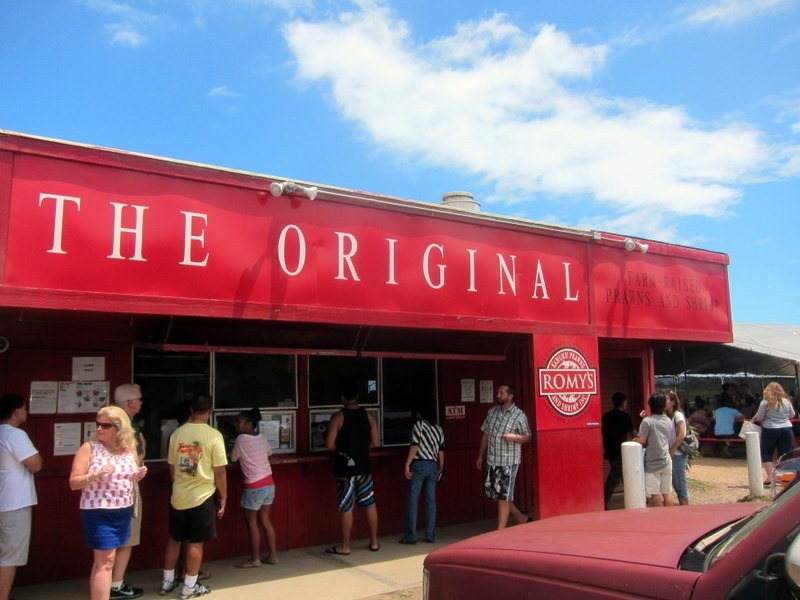 Our second stop of the day took us right across the street to Romy’s shrimp truck! 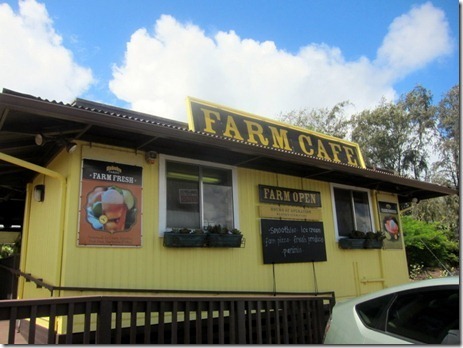 When I said Ryan and I were heading to Oahu, the foods that many of you guys said we try included malasadas (my favorite! ), shave ice and shrimp from the North Shore shrimp trucks. After loving your recommendations for the malasadas and shave ice, Ryan and I had high expectations for the shrimp from the shrimp trucks. Yet again, you guys were spot on! Each person in our press group was given a small box with white rice and four garlic and butter prawns with soyu spicy sauce from Romy’s. Oh my word. I was in shrimp-eatin’ heaven! Everyone dove into their box of shrimp and got nice and messy as we peeled the shrimp and said “mmm” aloud between bites. Before heading back to the hotel, we had two more stops on our agenda for the day. 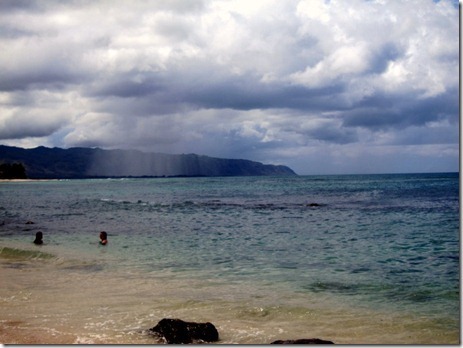 First up was a 10 minute stop at Turtle Bay, a small beach that is a known favorite of sea turtles. I was shocked to see two sea turtles resting on the sand (a volunteer stood close by and roped them off so visitors could not disturb them) and we saw four other turtles swimming in the ocean offshore. Before wrapping up our tour of the North Shore, our group made a pit stop at Matsumoto’s in Haleiwa for some shave ice. Though Ryan and I tried the shave ice a few days ago when we first arrived in Hawaii, I was excited to try new flavors. This time I ordered white cake, coconut crème and strawberries ‘n’ cream shave ice with ice cream and loved the flavor combination. Ryan got the Matsumoto that we both loved last time. 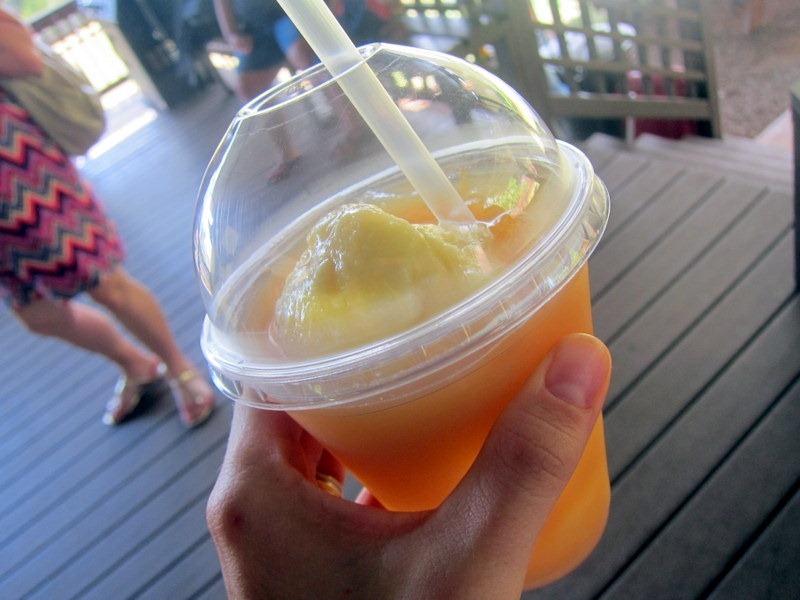 I’m convinced that shave ice is the perfect way to wrap up the day! P.S. The Fashion page was updated today. Wow-what a fun day! 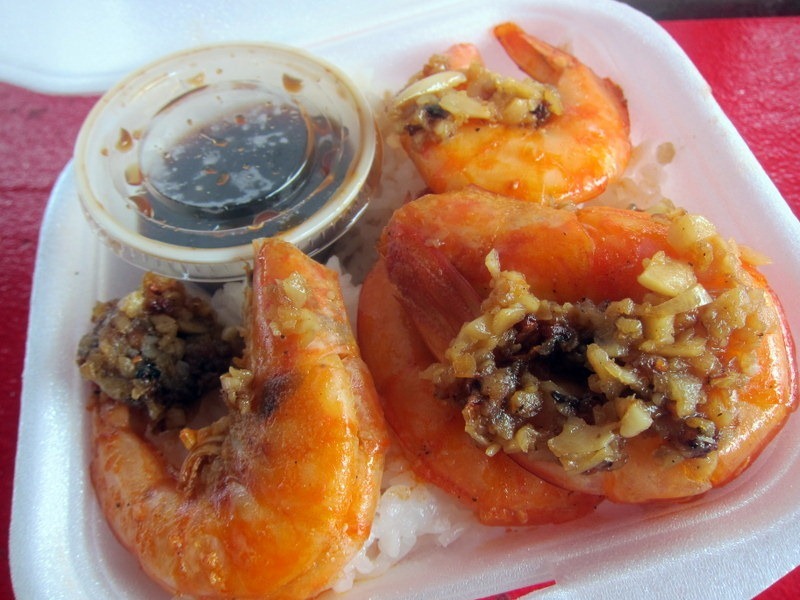 Shaved ice sounds amazing, as does the way that shrimp looks. Mmmm. I love me some shrimp! 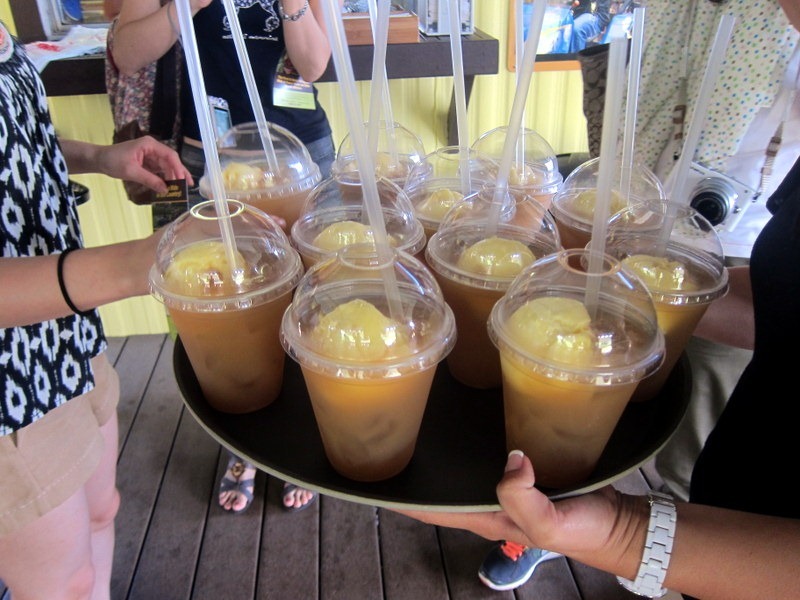 The plantation iced tea looks incredible! 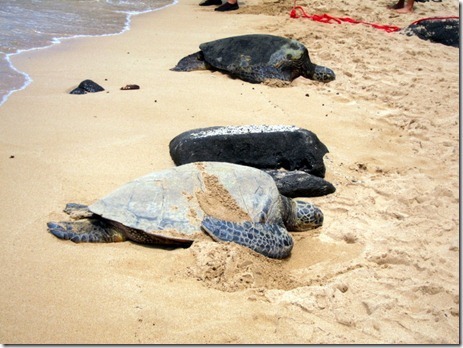 that must have been so cool to see the sea turtles! 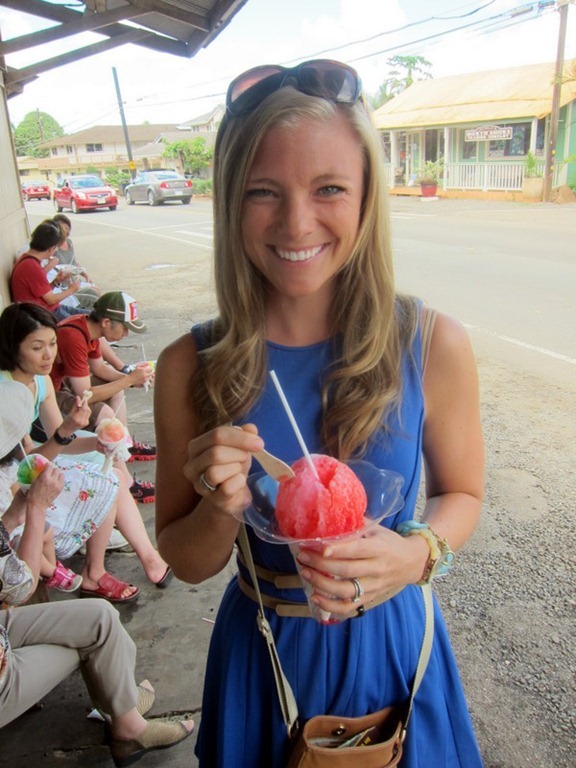 And I’ve only ever had snow cones, haha I’m assuming shaved ice is much better? Giovanni’s Shrimp Truck in the North Shore is even better! everything you’ve posted thus far has looked amazing! that shrimp looks absolutely delicious! I’d give three fingers on my left hand and my very well-loved freckles for one of those plantation smoothies!! They look absolutely delicious! Looks so awesome! I love the turtles! 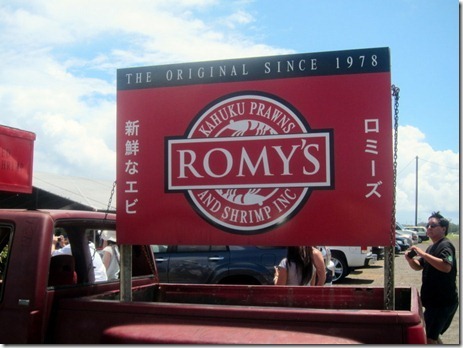 Oh wow, I would have gone nuts over the shrimp trucks! I didn’t even know that shave ice came in cake flavours.. definitely something I need to hunt down. Looks like a great day! 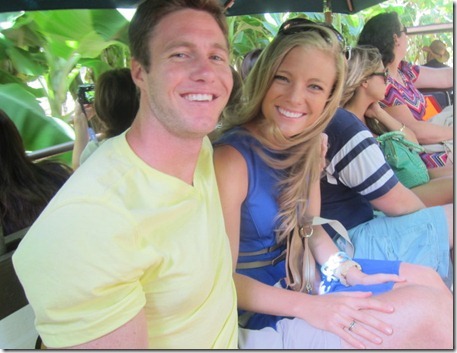 your trip was so much fun to follow! thank you for sharing! with all those amazing food adventures, what advice can you share to keep self-control and not over splurge!? i feel like that is always my biggest challenge when i go on a vacation. What amazing photos! It looks like you had an awesome vacation! Safe travels! Holy cow those iced teas look AMAZING! It looks like you two definitely got in an amazing vacation – I’m definitely jealous! 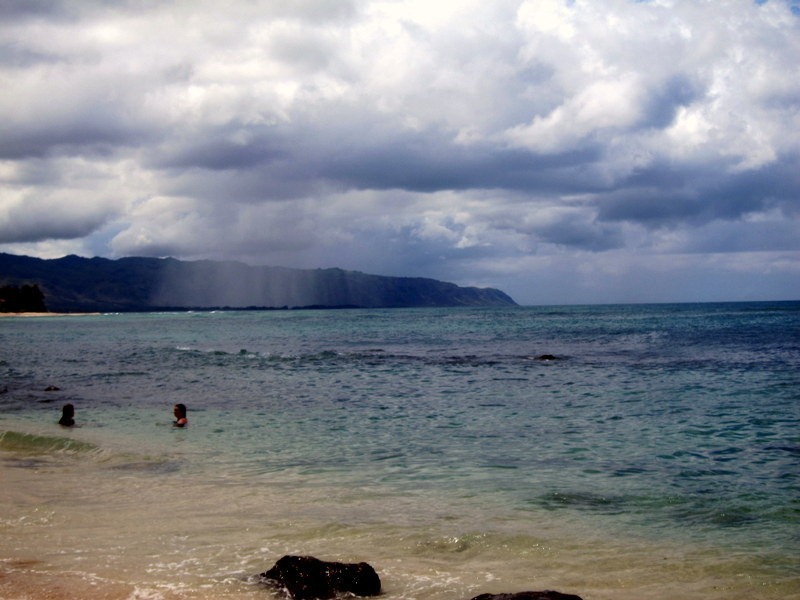 That picture of the water is amazing…it looks like it is raining in only a small spot in the distance…so pretty! Enjoy the last leg of your travels! What an amazing trip! I am sad that your Hawaii trip is coming to an end. I so enjoyed getting to experience such a beautiful place through your posts!! All that food looks mouth-watering! Love the sorbet in iced tea combo! Oooh that drink looks awesome! I would love to see one live! Sounds awesome once again- love your blue dress. aww turtles, that’d be an experience. The turtles are so cool, I can’t believe hot huge they are!! I had been wondering if your web hosting is OK? Not that I’m complaining, but sluggish loading instances times will often affect your placement in google and can damage your high quality score if ads and marketing with Adwords. Well I am adding this RSS to my email and could look out for much more of your respective fascinating content. Make sure you update this again very soon.